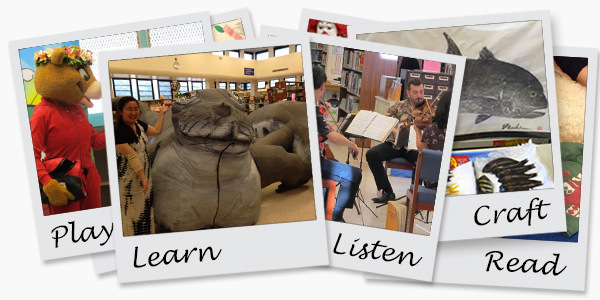 Welcome to the Aiea Public Library! Designed by architect Glenn Miura of CDS International and built on the site of the former Aiea Sugar Mill, our library opened on July 19, 2014. 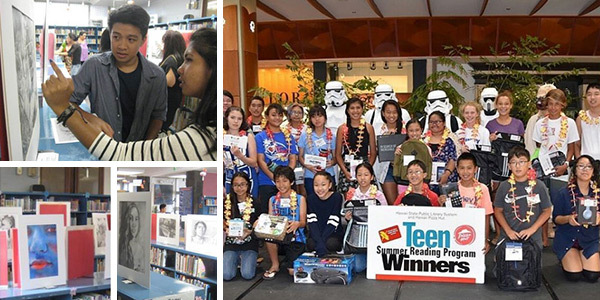 Our $10.4 million library replaces the original library building at 99-143 Moanalua Road. It includes features to reduce electricity costs such as a high-efficiency air-conditioning system and photovoltaic solar panels. 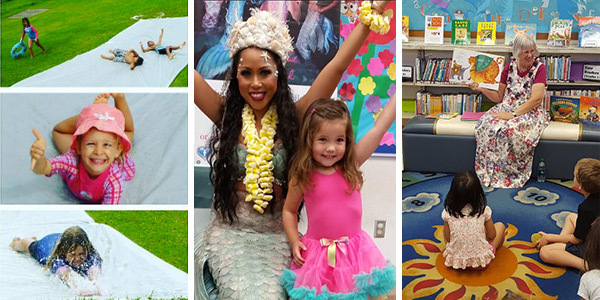 In August 2014, Aiea Public Library was awarded the coveted Leadership in Energy and Environmental Design (LEED) Gold Certification. packets for each book they (or guardian) borrow. 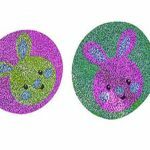 If a packet contains a shiny bunny sticker like the ones above, you win a prize! Hatch some fun throughout the month of April. More books borrowed = more chances to win! See the Information Desk to participate. 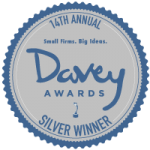 No purchase or consideration necessary to participate. Reading! Writing! Talking! Singing! Playing! This is a six-week series that will meet every Monday, from April 1st through May 6. This program is suitable for babies 0-23 months and their caregivers. Learn ways to interact with your little one to promote brain growth, bonding and fun! 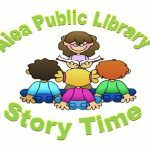 This short 20-minute program is filled with interactive rhymes, short read-alouds and songs. Stick around after for free-play and meet other caregivers in the community. We’ll be meeting in the Meeting Room across the walkway from the library. !!! Story Time has moved into the Meeting Room !!! Come and help create life-long readers. These 30-45 minute programs are full of books, songs, and activities that are designed to get kids ready to read. 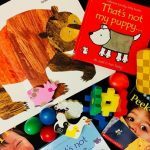 Children are encouraged to participate and engage with the stories, and activities with their grownups. Aiea Library’s April Movie Night will be on Thursday, April 25. We will be showing Aquaman, starring Jason Momoa, at 5:00 pm. 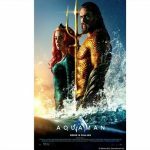 The description of the story is as follows from Movie Licensing, USA (www.movlic.com): From Warner Bros. Pictures and director James Wan comes an action-packed adventure that spans the vast, visually breathtaking underwater world of the seven seas, Aquaman, starring Jason Momoa in the title role. The film reveals the origin story of half-human, half-Atlantean Arthur Curry and takes him on the journey of his lifetime—one that will not only force him to face who he really is, but to discover if he is worthy of who he was born to be… a king. This movie is 143 minutes long and is rated PG-13.